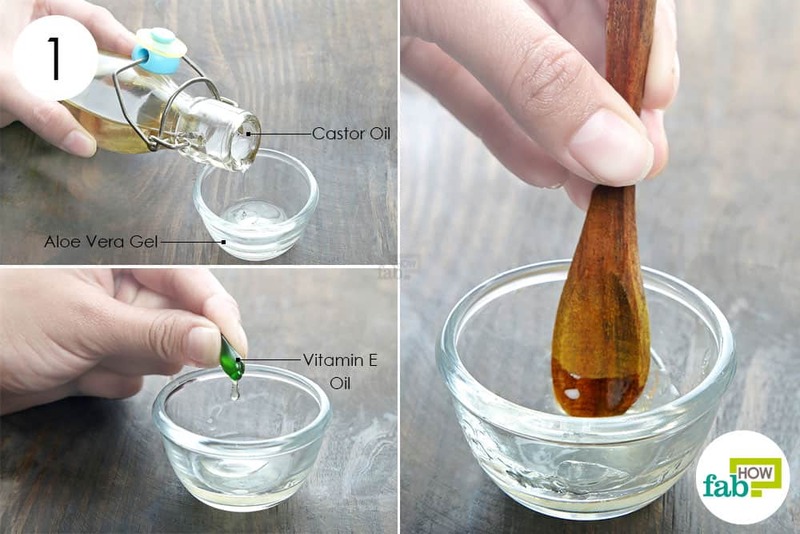 Home » Health and Beauty » Personal Care » Castor Oil for Thicker Eyebrows and Eyelashes: 6 Remedies that Work! We often ignore these feminine traits, but long eyelashes and fuller eyebrows contribute significantly in defining your face and enhancing your beauty. A poor diet and excessive use of eye products affect the quality and thickness of your brows and lashes. Shaving or over-plucking your brows also contributes to scanty growth. Plus, your genes play a significant role in deciding their shape and size. While the market is flooded with mascaras, brow pencils and fillers that make up for the lack of naturally fuller and thicker lashes and brows, regular use of these products can make them brittle and promote breakage. Also, these cosmetics don’t come cheap and put a burden on your pocketbook. 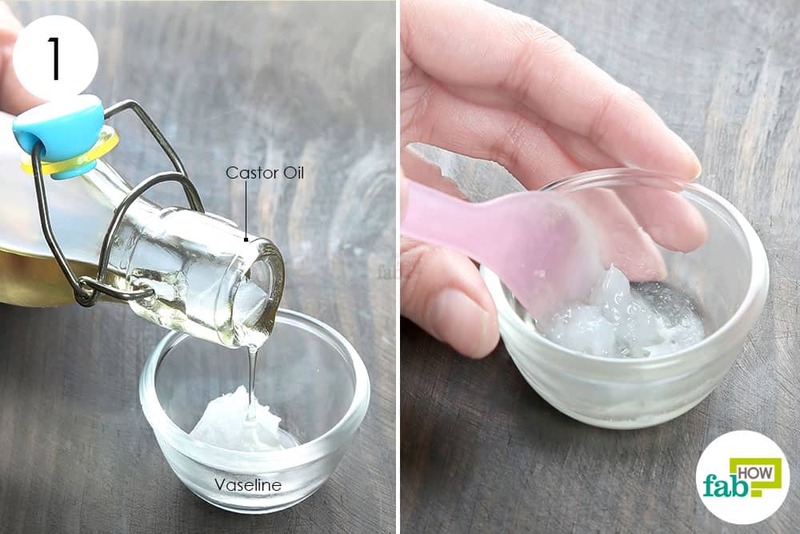 If you are not blessed with gorgeous brows and lashes, there is one inexpensive ingredient that can help you achieve naturally thicker brows and longer lashes – castor oil. Derived from the seeds of ricinus communis plant, castor oil is rich in ricinoleic acid, a monounsaturated fatty acid that nourishes hair follicles and promotes healthy hair growth. When applied over the eyebrows and eyelashes, it leads to thicker hair growth and can even activate dormant hair follicles. Before applying a castor oil remedy, remove all your makeup and wash your face thoroughly with a cleanser and warm water. 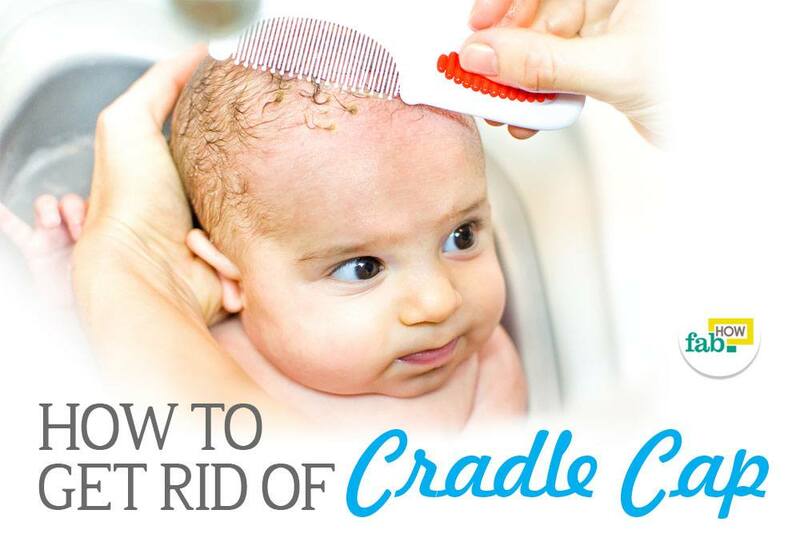 Note: Use 100% organic, cold-pressed and hexane-free castor oil only. Also, if applying castor oil causes any skin irritation, wash it off immediately. 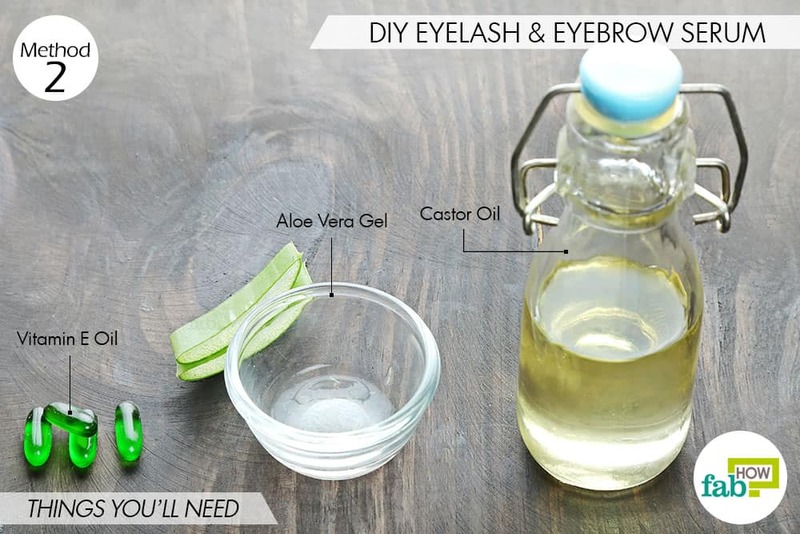 In case, castor oil doesn't suit you; you can check out our other remedies to grow thicker lashes and eyebrows. Else, proceed with any of the following remedies. Castor oil is safe to apply directly on your eyelashes and eyebrows to make them fuller and more voluminous over time. The thick castor oil helps cleanse the pores to dislodge any gunk, while the fatty acids in the oil help nourish and strengthen the hair follicles. 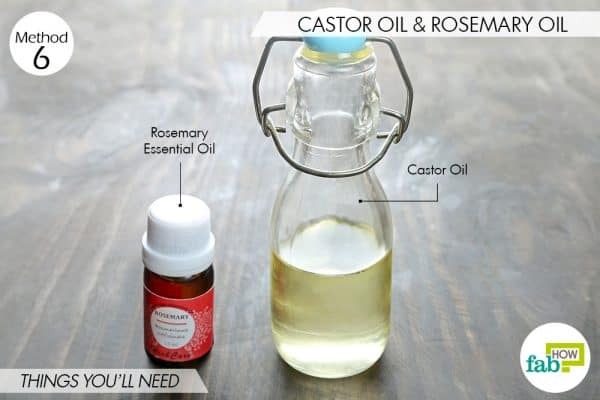 Since castor oil is a highly viscous oil, it is preferable to apply it at bedtime and wash it off in the morning. At bedtime, soak a cotton swab in castor oil and rub it along your eyebrows and lash line, coating the roots completely with the oil. Leave it on and go off to sleep. In the morning, wash off the oil with face cleanser and warm water. 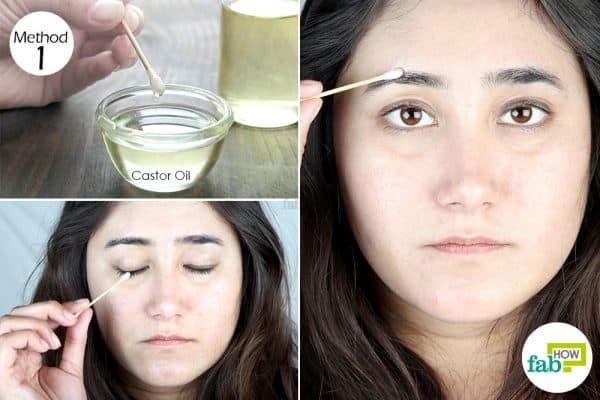 Repeat this remedy every night for at least 6 weeks to use castor oil for thicker eyebrows and eyelashes. Ditch those pricey commercial eyelash serums for this easy-to-make lash conditioner using castor oil and aloe vera gel. While the fatty acids in castor oil help moisturize and strengthen the hair follicles, the aloe vera gel helps form a protective coating on the hair shafts to prevent breakage. Aloe vera further adds a natural shine to your brows and lashes. Both castor oil and aloe vera are also antibacterial and antifungal and will kill any infection stalling hair growth. This serum also uses vitamin E oil, which boosts hair growth. Put ½ teaspoon of fresh aloe vera gel in a bowl. Ideally, use the gel fresh from an aloe vera leaf. Learn how to extract aloe vera gel. Add ½ teaspoon of castor oil. Puncture and squeeze out the contents of 4 vitamin E capsules. Use a spoon to blend everything well. Transfer the blend to a small container. At bedtime, use a clean mascara brush to apply the blend on your eyebrows and eyelashes. Coat the lashes and brows completely. Apply once daily for at least 2 months to use castor oil for thicker eyebrows and eyelashes. The shelf life of this serum is 1 week when kept refrigerated at all times. 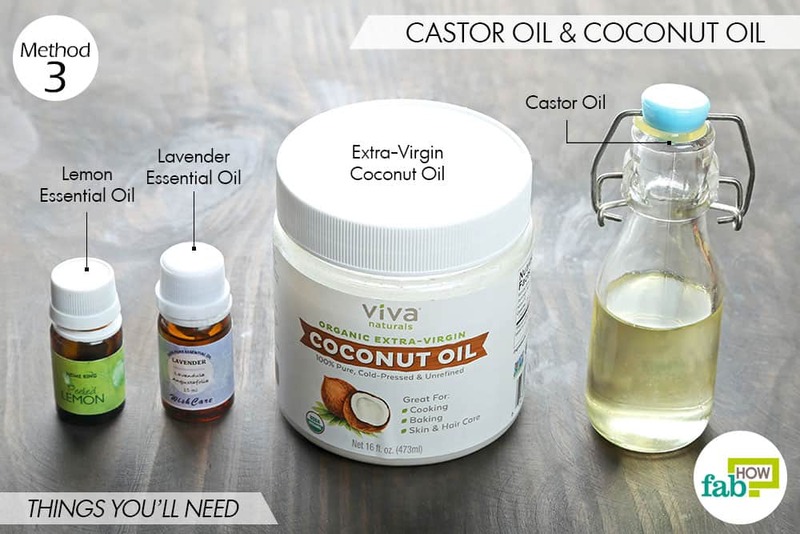 Castor oil can also be combined with coconut oil to get thicker eyebrows and longer lashes. Just like castor oil, coconut oil is rich in essential fatty acids that easily soak into your skin and deeply moisturize and strengthen your hair follicles. Together, the oils help unclog hair follicles and promote new hair growth. This oil blend also has lemon and lavender essential oils. The lemon oil works as an antibacterial to prevent infections, while the lavender essential oil helps further nourish your brows and lashes. Caution: Essential oils are concentrated oils and may lead to skin irritation in some individuals. It is advised to do a patch test first before applying it on your eyebrows and eyelashes. 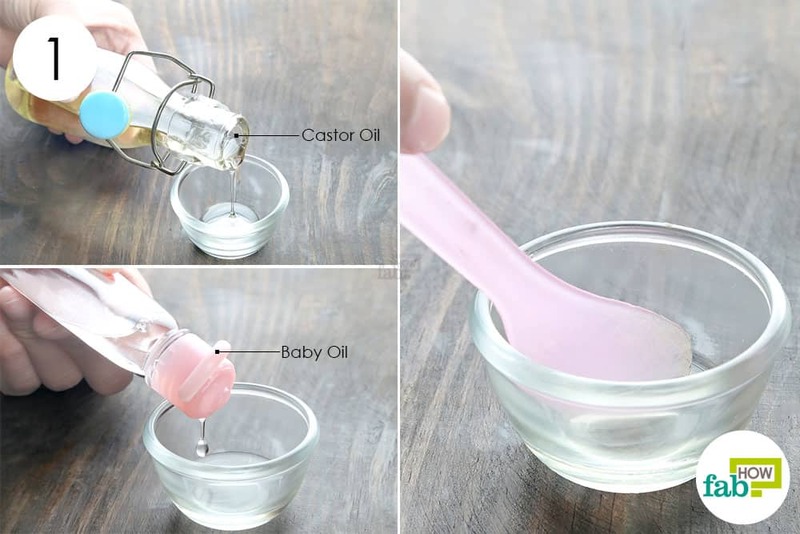 Pour 1 teaspoon of castor oil into a small bowl. Add 1 drop each of lemon and lavender essential oils. 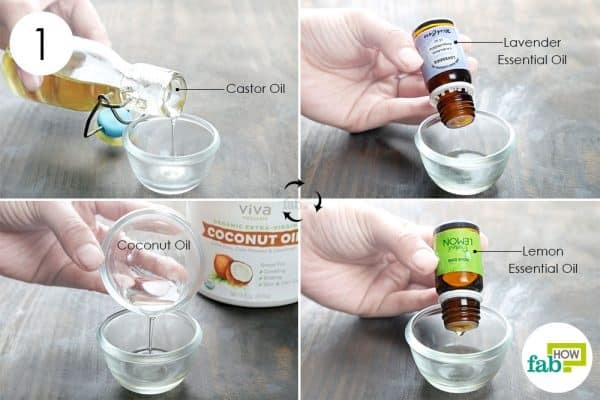 Add 1 teaspoon of extra-virgin coconut oil as well. Transfer the oil blend to a clean bottle. To use, simply dip a clean mascara brush in the oil blend and stroke it over your clean lashes and eyebrows. Do this at bedtime and leave it on overnight. Thoroughly wash out the oil with soap and water in the morning. Repeat once every day for 2 months to grow thicker eyebrows and long lashes. Store the oil blend in a dark and cool place for 3 to 4 months. Vaseline is a must-have in your vanity. Applying it on your brows and lashes can help deeply moisturize the hairs and stimulate hair growth. Combining it with castor oil forms a deep-conditioning mask for your eyebrows and lashes and makes them appear thicker and darker. 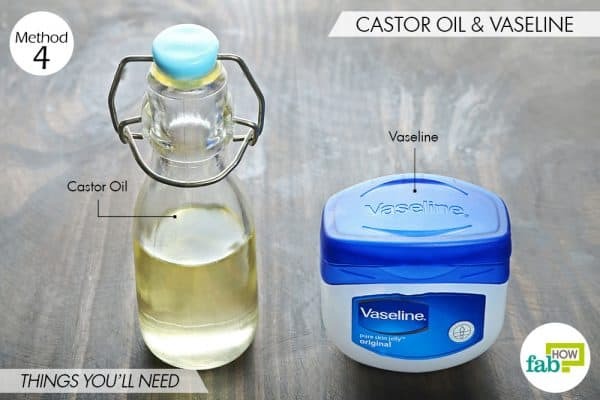 Put ½ teaspoon of Vaseline in a small bowl. Spoon out the blend into a small container. Use your finger to rub the blend on your clean eyebrows and eyelashes. Do not go overboard, as the Vaseline can weigh down your lashes and lead to breakage. Use a mild cleanser and warm water to wash it off the next morning. Apply this mix 3 times a week to get fuller brows and fluttery lashes in 6 to 8 weeks. The blend will stay good for 3 to 4 months. 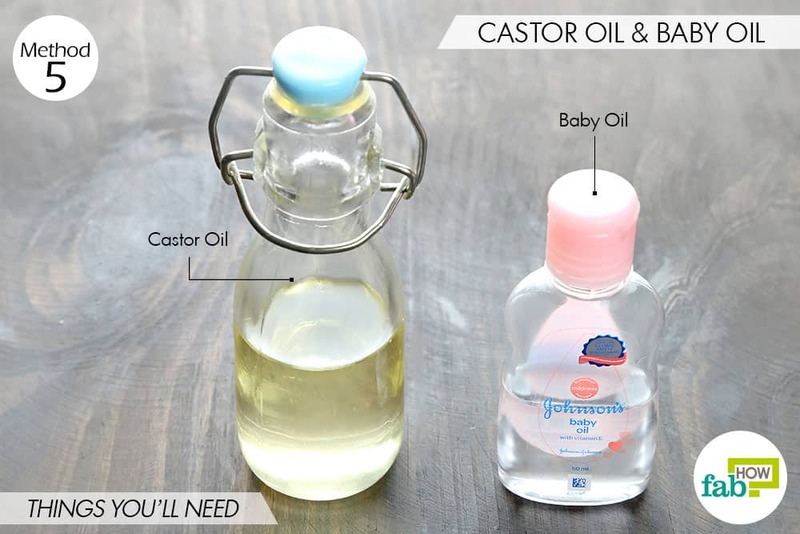 To get baby-like long lashes, try combining castor oil with baby oil. Both castor and baby oils are loaded with fatty acids that help moisturize your hair follicles to make your brows and lashes thicker and longer with regular use. 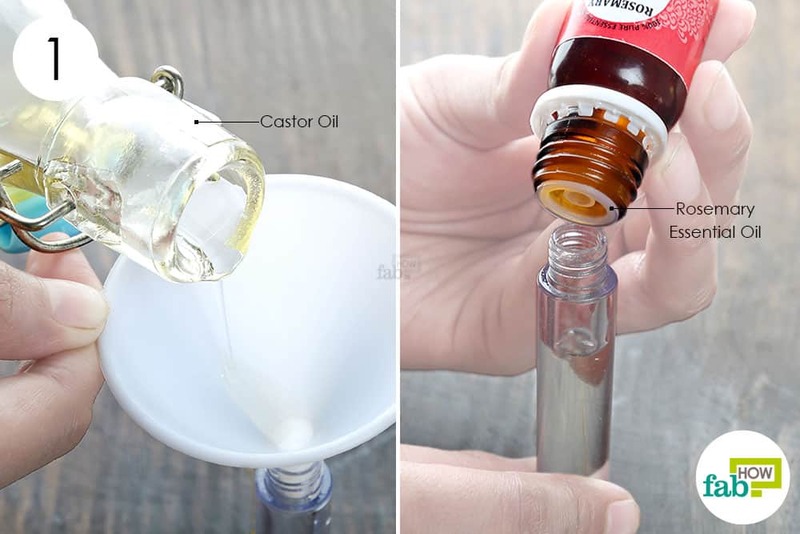 Pour 1 teaspoon of castor oil into a bowl. Add 1 teaspoon of baby oil to it. 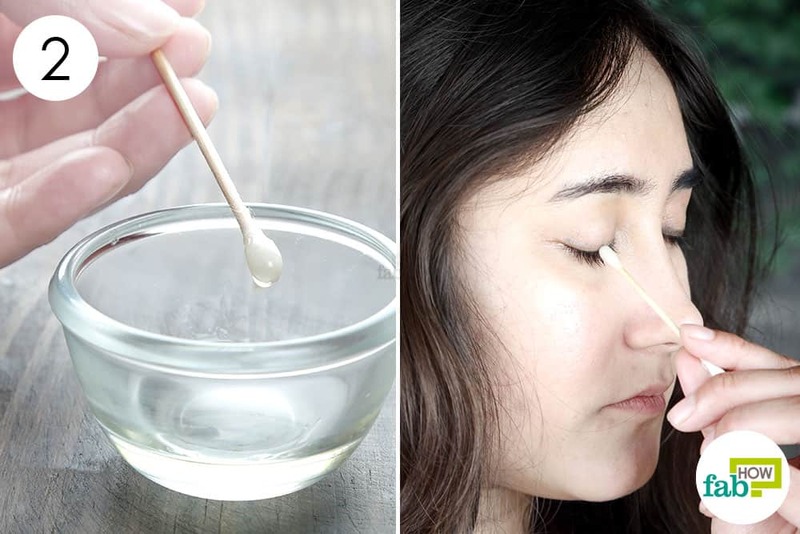 Dip a cotton swab in the oil blend and rub it over your eyebrows and eyelashes. Focus more on the lash line to nourish the roots. Leave it on for 4 to 6 hours or overnight. Wash it off in the morning with lukewarm water. 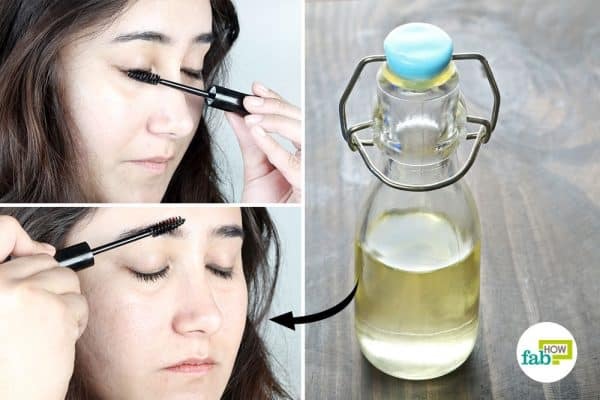 Repeat daily for 2 months to use castor oil for thick eyelashes and eyebrows. Rosemary is a popular essential oil used to boost hair growth. Blending it with castor oil and applying it on your lashes and brows will nourish them and make them grow faster. Rosemary essential oil also strengthens the roots and prevents hair loss. Fill up an empty mascara tube with castor oil. Use a small funnel to avoid spilling it. Add 1 drop of rosemary essential oil. 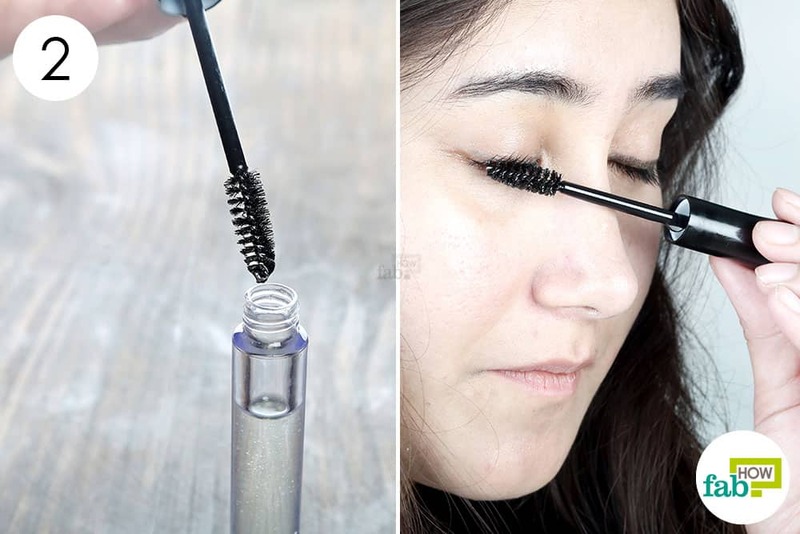 Screw on the cap of mascara bottle and shake it well to blend the two oils. 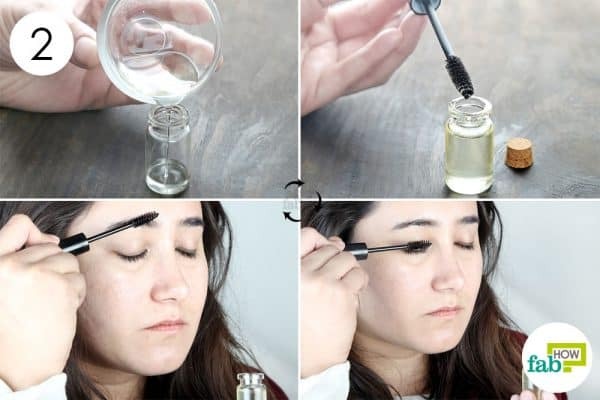 Before hitting the bed, apply the oil on your eyelashes and eyebrows. Have a good night’s sleep and wash it off in the morning. Repeat once every day for 2 months to use castor oil for thicker eyebrows and eyelashes. The shelf life of this blend is 3 to 4 months. If you are used to applying makeup every day, take a break at least once a week and go makeup-free. This will allow your skin and hair follicles to stay healthy. Always remove your makeup before going off to sleep to prevent infection. 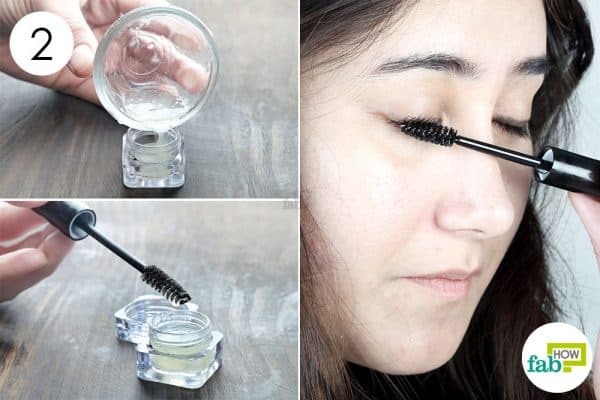 You can also check out our makeup hacks if you wish to fake thicker eyebrows for a day or two or want to learn new makeup tricks. Since you will be applying the oil blends close to your eyes, it may accidentally enter your eyes and can sting. If that happens, immediately rinse your eye with cold water.